I am going to tell you right now… you need to make this recipe. I have made it twice already in less than a week! It is healthy and will satisfy your craving for lasagna. 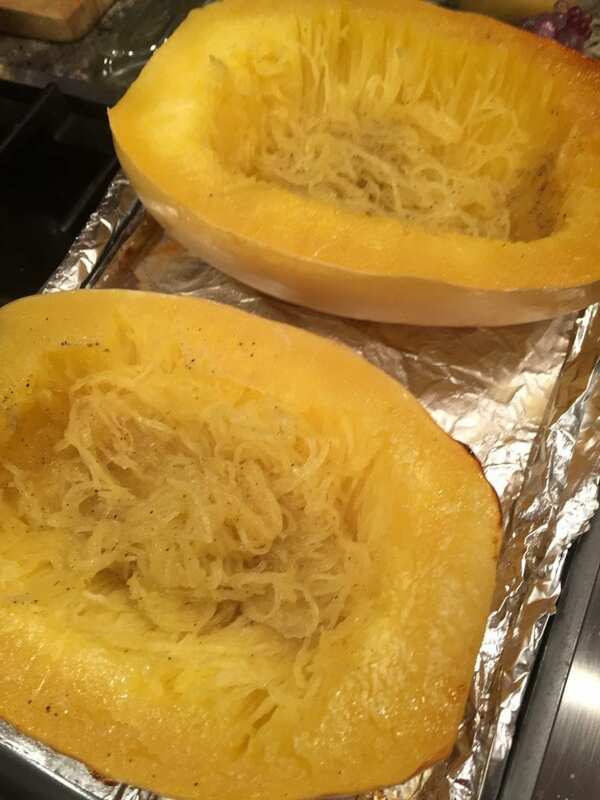 Spaghetti squash is such a great vegetable because you can do so much with it, like this recipe uses it as a bowl for the lasagna. It is a perfect alternative for pasta and much lower in calories and naturally gluten free (for those of you with Celiac disease or gluten sensitivities). Eating a more plant based diet will provide your body with more fiber, vitamins, and other nutrients that can help prevent obesity and other chronic diseases. 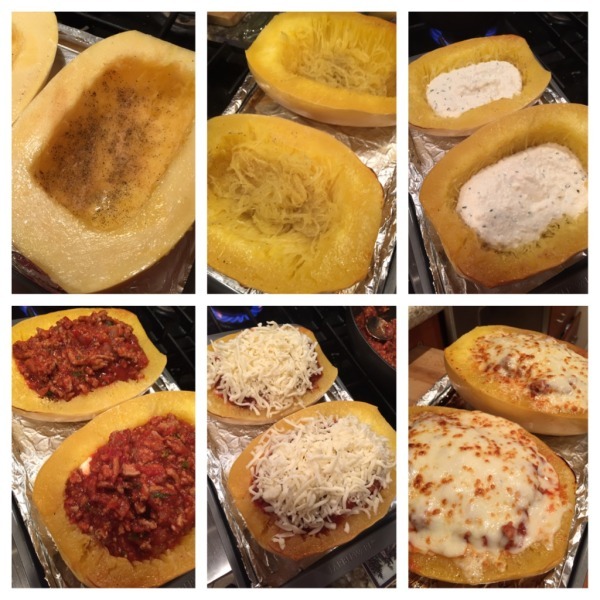 If you are looking for a low-carb option, spaghetti squash is going to be your best friend! 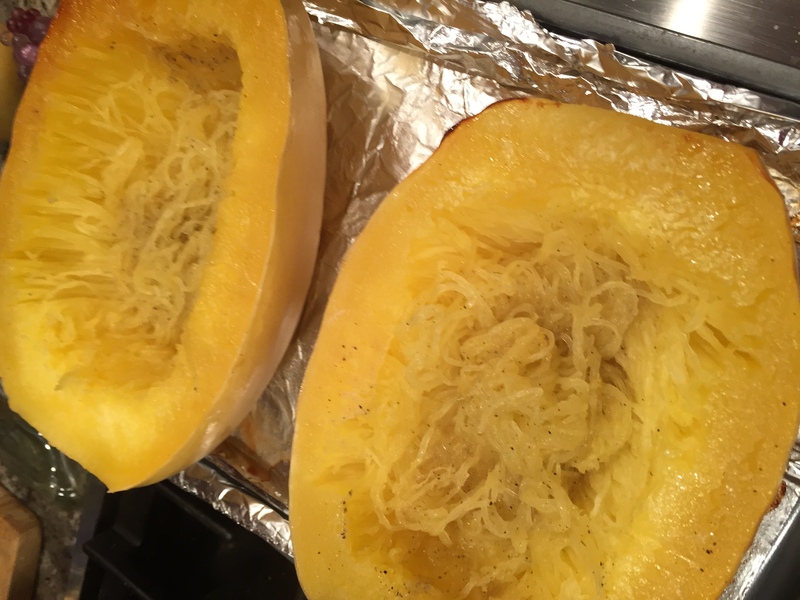 You can save a ton of calories by eating spaghetti squash and won’t have that guilt feeling you may get after eating a plate of regular spaghetti covered with sauce and cheese! How do I cook my spaghetti squash? It is SO simple. Cut your squash in half and scoop the seeds out, just like you would do with a pumpkin on Halloween. You can save the seeds too and roast them like pumpkin seeds! 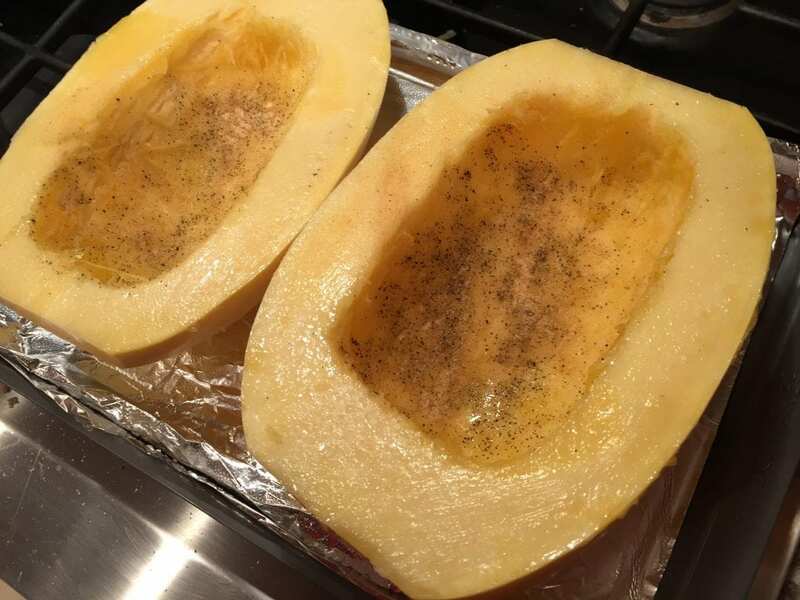 Next, brush the inside of the squash with 1-2Tbsp extra virgin olive oil and sprinkle with salt, pepper, and garlic powder. 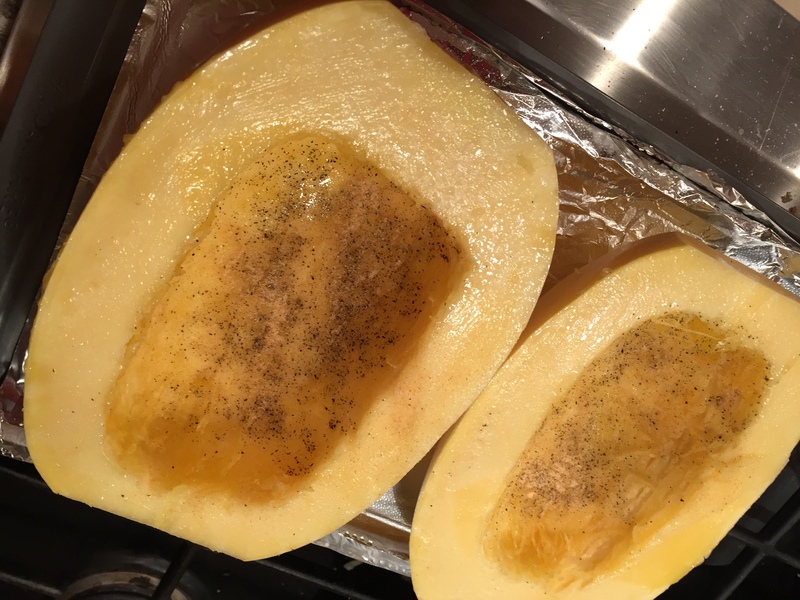 Place the halves on a baking sheet lined with foil and make sure the squash is placed with the skin side up. (Do not cook the squash like I have shown in the picture below, flip them over!) Cook in a preheated 425 degree F oven for 30-40 minutes, or until tender. You can also place the squash in the microwave but I like using the oven 🙂 When the squash is ready, scrape a fork into the flesh and spaghetti-like strand will appear – it is actually really cool! My mom says… “It is such a smart vegetable!” haha. Do not scrape all the strands, just enough to make room for all the filling. Cook the spaghetti squash like mentioned above 🙂 30-40mins at 425 degrees. While the spaghetti squash is in the oven, cook the turkey and set it aside. Sprinkle salt, pepper, and garlic powder on it for some flavor. Heat oil in a large pan over medium heat, add onion and cook until tender. (~5 minutes). Add the garlic, red pepper flakes, fennel and cook for ~1 minute. Add the turkey, tomatoes, tomato paste, Italian seasoning, bay leaves, paprika, balsamic vinegar, s +p and bring it to a boil. Reduce the heat and simmer until squash is done. Mix in the basil and then remove sauce from heat. Fluff up some of the inside of the squash and scoop the basil/ricotta mixture into the squash halves. Follow with the meat sauce and place the mozzarella on top. Broil in the oven for 1-3 minutes, or until cheese has melted and turned a golden brown. **This recipe will make a lot of food! You can share one half with someone and still have leftovers. It is perfect for taking to lunch the next day as well. Trying this tonight Tawn! I cant wait! Might i just say you are an inspiration and always look happy and healthy! !